For the new international brand campaign of Takeaway.com, in the Netherlands better known as Thuisbezorgd.nl, and commissioned by Etcetera, we created the commercials, photography, banner campaign and casting. A cross-medial project where all departments of Lukkien contributed to. 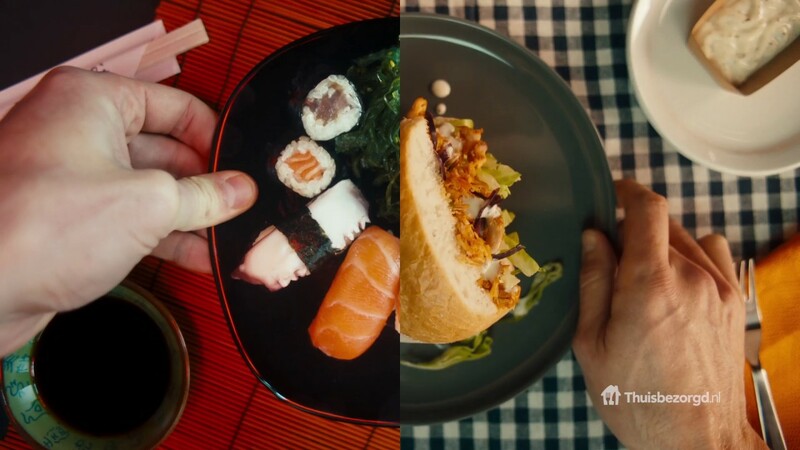 Takeaway.com is positioning itself internationally with a new brand campaign focusing on 'your time'. The campaign links everyday moments to this brand idea and shows the multiple occasions where you can order food. Takeaway.com is for everyone, anytime, anyplace. Lukkien translated this concept into a six day shoot on location and in our in-house studios. For the location shoot we filmed at the most cool places in Amsterdam and Rotterdam. The atmosphere and experience is reflected in the final result of the TV commercial. Bart Reef, Strategy Producer Lukkien: "It was a very nice production. He entered with a flag "We have to make something really cool of this" and we did. " Takeaway.com does not just broadcast a TV commercial in its five core markets: Germany, Poland, Netherlands, Belgium and Austria. Also banners play an important role in the campaign. Lukkien Digital has produced a total of 400 banners in seven languages ​​for 6 different campaigns. Thuisbezorgd.nl was founded in 2000 by student entrepreneur Jitse Green. Its Dutch parent company Takeaway.com is now processing millions of orders per month for more than 30,000 affiliated restaurants in Europe and recently went public.